Log The strongest of the Piranha Plants. It likes to live... in pipes. That's a Piranha Plant. In fact, I think this is the strongest type of them all. Max HP is 15, Attack is 9 and Defense is 0. Its Attack power is absurdly high... It may look like a normal Piranha Plant, but don't be fooled! It's super-tough! If we get beaten by a flower, we'll never hear the end of it, know what I mean? 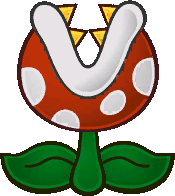 Piranha Plants are enemies found in Paper Mario: The Thousand-Year Door. They are the strongest of all Piranha Plants and like to live in pipes, as indicated in the Tattle Log, despite the fact that no Piranha Plants in the game appear in pipes (though this more likely references the regular Piranha Plants from the Super Mario series). They have the second-highest statistical attack power in the game, exceeded only by an Amazy Dayzee, which is 20. It also has absurdly high HP, only being beaten out by a handful of non-bosses, such as Dark Craws and Dark Koopatrols. Despite their toughness, they are easily put to sleep, incapacitating them for a few turns. They also have a good chance to be confused, possibly making them attack other enemies with massive strength. Piranha Plants are rare in Paper Mario: The Thousand-Year Door, found only in the Pit of 100 Trials in floors 81-89. In Super Smash Bros. Ultimate, "Killer Pakkun" is mentioned briefly by Viridi during the Japanese Palutena's Guidance dialogue for Piranha Plant. It does not get a respective mention in the English version, like Fiery Walking Piranha and the generic "Pakkun." This page was last edited on January 30, 2019, at 16:26.